Financial Technologies (India) Ltd, the Mumbai-based company founded by beleaguered businessman Jignesh Shah, has agreed to sell its entire 27.3 per cent stake in Dubai Gold and Commodities Exchange (DCGX) for about $11 million (Rs 74.7 crore). In separate stock exchange filings, FTIL said it will sell its 13 per cent stake in DCGX for $5.2 million while a wholly owned subsidiary will sell a 14.3 per cent holding for $5.8 million to Dubai Multi Commodities Centre (DMCC). DGCX is a venture between FTIL and DMCC, which is owned by the Dubai government. The bourse was set up in 2005 and is the only derivatives exchange in the Middle East. It also offered trades in dollar-rupee futures. The transactions are subject to certain conditions, including regulatory approvals, FTIL said. The stake sale follows FTIL’s exit from the commodity exchange business in India after the Forwards Market Commission, the commodities market regulator which has now been merged with capital markets watchdog SEBI, declared the company and its founder Shah unfit to run the business. The Securities and Exchange Board of India had also declared FTIL and Shah unfit to run exchanges after a payment crisis at FTIL-promoted National Spot Exchange Ltd.
Reserve Bank of India rules restricting any equity shareholding in overseas exchanges trading in rupee-linked financial products also prompted FTIL to exit from DGCX. 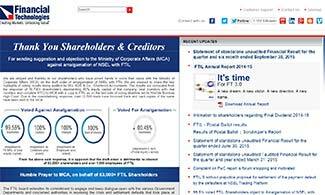 FTIL, directly and through its subsidiaries, has trimmed its stake in various overseas exchanges as well as mobile transaction and payment gateway company ATOM. Most recently, it exited from Indian Energy Exchange Ltd (IEX), the country's biggest power trading bourse. Shares of FTIL were 9 per cent higher in afternoon trade on Friday in a Mumbai market that was up 1.2 per cent.